The invention of the shipping container revolutionized the global trade in goods from the 1950s on. While it may be tempting to think of globalization as a core characteristic of modernity that has steadily progressed since the First Industrial Revolution, this is not the case. The last major reversal occurred thanks to the First World War and the subsequent period of economic turmoil. Indeed, levels of global economic integration reached a peak in 1914 and it took until the second half of the 20th Century for these heights to be recovered. The falling cost of transport and communications makes it viable to exchange more things, just as the steamship reduced the time and cost to cross the Atlantic on a reliable schedule during the 19th Century. But it’s important to note that it’s only when a technology becomes a system that the world changes. The intermodal shipping container, which revolutionized global trade in goods from the 1950s on, is far more than a steel box – it is a set of standards that define the dimensions, strength and lifting points of containers, which complement the design of cranes, ships, trucks and trains around the world. The first purpose-built container crane could shift loads at more than 40 times the average productivity of a longshore gang using “break bulk” methods of shipping. Thanks to the spread of global standards that were formed in the mid-1960s, this productivity was able to spread around the world. And this directly affected employment in the shipping sectors, as manual jobs were automated by the arrival of cranes and containers. Global trade and global wealth not only jumped but moved to a new rate of growth which persisted over decades as entrepreneurs and whole new economies found it viable to supply to markets around the world. It is worth noting, however, that this benefit did not come without a cost. The number of registered longshoremen on the US East Coast fell by more than two-thirds from 1952 to 1972. The number of dock workers in the United Kingdom fell from over 70,000 in the early 1960s to under 10,000 in the late 1980s. The offset in jobs and opportunities more than adjusted for these losses, as overall gains were orders of magnitude higher, but for dockers, longshoremen and their families, it meant finding new income. The spread of the internet and the relatively low cost of digital technology mean that people lucky enough to have access to digital networks are becoming more global and more local at the same time. Small traders in shanties on the outskirts of Nairobi export across east Africa. In China, ‘Taobao villages’ allow previously cut-off rural populations to sell goods on Alibaba’s trading platform. New industrial technologies – including 3D printing, new forms of factory automation and machine learning – are rapidly enabling the mass personalization of products and local optimization of supply and demand. As a result, the maker movement and the sharing economy are both expanding rapidly. This is increasing the number of people who can use technology to create value. In 2016, GSMA found 314 tech hubs across Africa. Less than two years later, this number had grown almost 50% to 442. 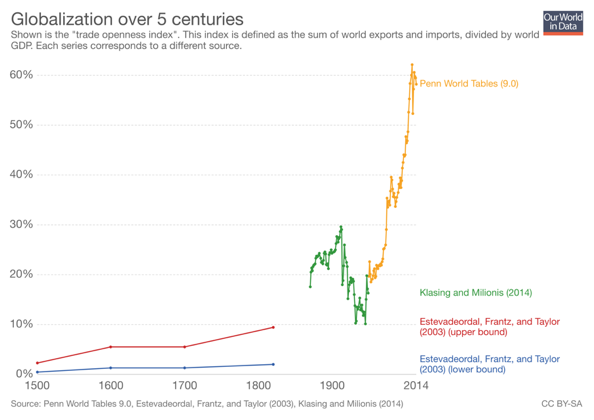 Globalization is, of course, not just about trade in goods. In 1967, in his book The Gutenberg Galaxy, Marshall McLuhan coined the term the Global Village, laying out a remarkably prescient view of the benefits and risks of an increasingly shared global media space. Culturally, those connected to the internet are part of the same village conversations. This brings the opportunity both for enhanced cultural understanding and empathy, as well as the risks of polarizing dynamics. On everything from domestic and international politics, to gender, race or other social issues, the stories that dominate our societies are no longer shaped by a small group of sources that are considered authoritative and trusted – now everybody has a voice. The cool, assured tones of the BBC World Service or PBS compete with a cacophony of opinion, the ‘outrage economy’, and a relentless stream of ‘Twitter meltdowns’. The expanded space for opinion reduces the relative space for fact. Worse still, these very dynamics can be intentionally used to create discord in the pursuit of discrediting people, ideas or institutions. The race for technological advancement also lays the foundations of geopolitical influence, including the ability to influence the form of globalization. Technologies have always granted those countries and organizations that could master them economic, military and political power to different extents. Today, countries are aggressively investing in technologies such as artificial intelligence and quantum computing. In fact, successfully harnessing new technologies is likely to be far more consequential than inventing them. In his recent book AI Superpowers, Kai-Fu Lee argues persuasively that China is among the best placed to win the next phase of the AI race, based on its ability to implement cutting-edge machine learning techniques and leverage its access to massive amounts of data in an AI-friendly regulatory environment. Indeed, a Chinese company, Yitu, won the 2017 Face Recognition Vendor Test, a benchmark organized by the National Institute of Standards and Technology, which serves as the official guideline for US government purchases. 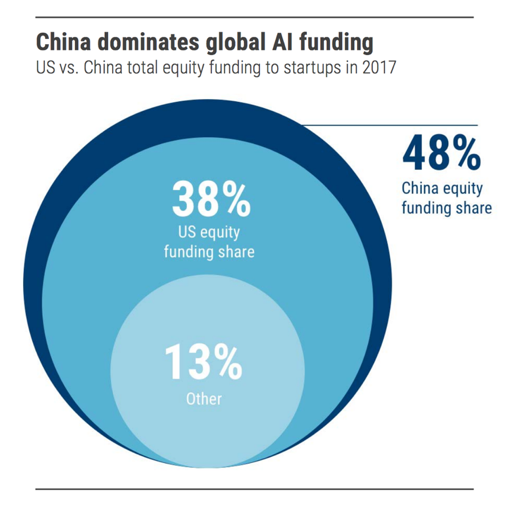 Meanwhile, Chinese AI startups received 48% of global AI funding in 2017 – compared to 38% for US AI firms. The Fourth Industrial Revolution is set to reshape economic power, scientific leadership, and the architecture of value chains as well as future forms of political organization. This has big impacts for how states relate to one another in the next phase of globalization. Global rules and institutions – just like technologies – are far from neutral. They embed our values, assumptions about the world, and desires for what we think the future should look like. Past periods of globalization have been justly criticised for leaving people behind while also being celebrated for generating wealth, spreading technologies and raising living standards around the world. But we can, and should, do better in Globalization 4.0. The printing press is often cited as an historical precedent for our tech-driven revolution in society. A key milestone in the democratization of information and knowledge, it empowered individuals and permanently altered economic, social and political structures. Literacy, education, scientific progress and political participation became the currency of all, rather than a few – leading to changing values, norms and life expectations. We need to ensure that the technologies driving the next phase of globalization are human-centered and driven by positive values. In particular, as the World Economic Forum’s forthcoming report on Digital Futures notes, we should aim for systems and technologies which are inclusive, trustworthy and sustainable. What does this mean? Well, at the same time as we celebrate the opportunities of AI to make our organizations more productive, we need to be closing the digital divide and making sure algorithms challenge, rather than reinforce, existing prejudices and discrimination. And, as we start to use distributed ledgers to revolutionize global finance, we need to be deploying the blockchain to help refugees prove their identity and to help civil society organizations track commitments to sustainability. Most of all, those of us lucky enough to have the power to develop, invest in or even just use the latest technologies should do everything we can so that those with the least amount of power feel that technology is on their side too. Both the Fourth Industrial Revolution and Globalization 4.0 are opportunities to fix what went wrong in previous eras. And that starts with building a shared commitment to a shared future, based on those values which are truly cross-cultural: striving for the common good, safeguarding human dignity, and acting as stewards for future generations.